At Scripps Networks Interactive's first NewFronts presentation, the media company brought out DIY Network stars Vanilla Ice and Rev Run, Food Network celebrity chef Bobby Flay and a few other members of its not-quite-marquee talent pool. Perhaps more importantly, Scripps trotted out a handful of intriguing numbers for potential advertisers to chew on at its midtown Manhattan event, but more on that in a bit. SNI will offer 125 new Web series this year, including Salvation Star, a spinoff of the Food Network's Food Network Star series where former contestants get another shot—but only online this time. Additionally, DIYNetwork.com will soon debut Ice Goes Digital, starring the aforementioned 1990s-era pop performer, as well as Rev & Justine, featuring the 1980s rap legend and his wife Justine Simmons. The Cooking Channel gets two new online programs in Two Top (where pop culture and food collide) and Fodder (a humorous look at food). Additionally, Scripps revealed online programs for its six-month-old channel Ulive. "Our fans eat these experiences up, and they want more," said Bob Madden, general manager and svp for the digital food category at Scripps. Consumers spend 664 million minutes on Scripps' digital properties each month. Digital properties for FoodNetwork.com, CookingChannelTV.com and Food.com total 45 million monthly uniques. Travelchannel.com got 73 million visitors last year. Scripps' brands have 40 million fans/followers on social media channels. Its food properties have 17 million fans/followers. Its viewers are three times as likely to be remodeling their home. 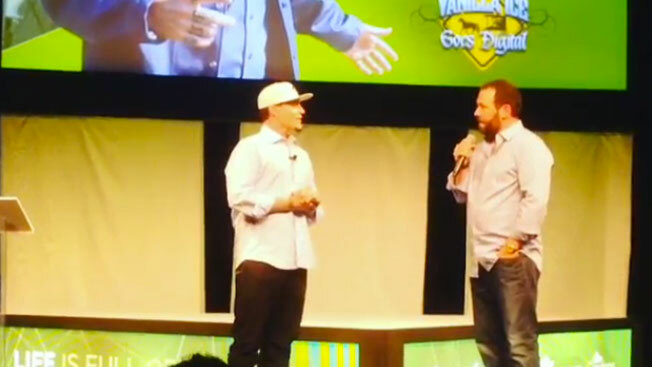 Meanwhile, check out Scripps' NewFronts host Bert Kreischer (also the star of Travel Channel's Trip Flip) talking to Vanilla Ice about his experiences in reality show Vanilla Ice Goes Amish via the Instagram video below.